Determine a service schedule that best fits your company’s needs. We offer shredding schedules ranging from daily to monthly and everything in between so you have the flexibility to choose a consistent schedule that works for you. 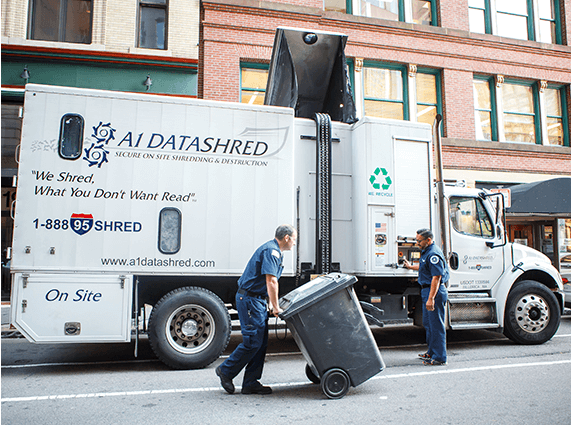 A1 DATASHRED offers Scheduled Shredding Services to businesses, healthcare providers and organizations of all kinds in Massachusetts, New Hampshire and Rode Island looking to securely shred business records on a continual basis. Give A1 DATASHRED a call and our experienced staff will work with your company to determine a service schedule that best fits your company’s needs. We will provide locking containers for your office. A1 DATASHRED will provide your company with locking consoles and/or bins that will be placed in locations throughout your office so your employees will be able to conveniently dispose of the documents just steps away from their work area. The actual number of containers will be based on your office layout, the volume of paper and the number of staff that need to be serviced. Once the consoles and/or bins are in place, your staff will then be able to dispose of business records, file folders, and any other paper documents into the locked containers. Our Containers remain locked at all times to secure your confidential documents. Our technicians arrive at your location. Then our technician will arrive at your location with one of our state-of-the-art paper shredding trucks on your scheduled date. There will be no need for you to worry about scheduling your service each time because you will be on an automatic reoccurring schedule. The technician will empty each container into a secure bin to move your business records to the shredding truck for destruction. The bin tipper will grab, raise and empty the bin into the industrial shredder and your documents are destroyed. All of our paper shredding trucks is equipped with a closed-circuit camera system that gives our customers the opportunity to see their documents being turned into small unreadable particles. Why you need a scheduled shredding service? You have an obligation to your clients, your employees and your business to protect private information. You also have a legal obligation to protect that private information under both federal and state privacy laws. Those ethical and legal obligations also include documents that you want to throw away. Privacy laws require that any documents that contain confidential information must be shredded before they are disposed of or you may face stiff fines and penalties. An ongoing shredding program will help your company be compliant.